Merella Fernandez joined CTV News Channel in 2011 as a correspondent. The move was a homecoming for Fernandez, who launched her career with an internship at CTV and later took on her first formal role as an editorial assistant with CTV NATIONAL NEWS and CANADA AM. 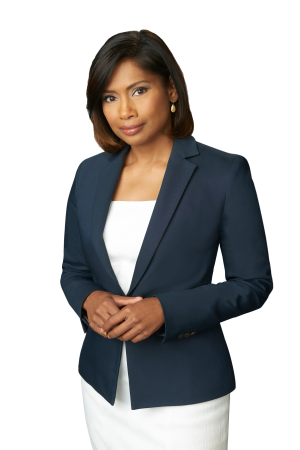 Prior to returning to CTV, Fernandez was an anchor and reporter for Toronto’s CityNews over a ten year span in addition to being a writer, reporter, and anchor for CP24. Throughout her career, she has covered a wide range of breaking news and major events. She reported on the SARS outbreak, interviewed Julia Roberts on the red carpet at TIFF, and covered the visit of Prince Charles to Canada in 2012. In 1995, Fernandez earned a Bachelor of Journalism from Carleton University, intending to pursue a career in print journalism. Following her internship with CTV NATIONAL NEWS, Fernandez was so inspired by observing her peers in the newsroom that she immediately changed tracks to pursue broadcasting and has never looked back. Born in Karachi, Pakistan, Fernandez and her family immigrated to Canada when she was just a year old. In her spare time, she serves as a mentor for immigrants who want to work in Canadian media, tutors inner-city youth, and hosts a show in Toronto honouring the accomplishments of new Canadians.